Darwin is a tourist’s delight. It’s a place bounding with natural beauty and marvelous scenery, enough to make any nature lover happy. It’s also a place with enough thrilling sights and activities to make the adventure-seeker happy! Read on to know more. Lie on a deckchair on the beach and watch movies against the backdrop of starry blue skies! It’s an amazing experience – if you’re lucky, you’ll be able to see a shooting star or two fall to earth even as you exclaim over the stunts of your favorite movie. Learn about the role Darwin played in WW II, via an interactive multimedia experience. See iconic objects of the time of the immersive Bombing of Darwin Gallery, firsthand accounts of the war and other memorabilia. Watch a chillingly accurate reenactment of the fierce Cyclone Tracey that devastated Darwin in 1974 in the “Black Room.” Explore the lovely tropical gardens that surround the museum. Take your time to explore and admire the Southeast Asian, Oceanic and Aboriginal art stored here. Kids love this park, with its 3 monster slides, a water playground and a water park with swimming areas. There’s also a basketball court, picnic areas, dry playground, BBQ’s, a cafe and plenty of trees and shady areas to rest. It’s a beautiful area, well worth the trip. There are many swimming holes here, amidst rocks and lush greenery. They are usually visited by crocodiles, so be careful. Perfect spot for some croc-watching. If you’re interested in military exhibitions, you’ll be thrilled by the A B-52 bomber here, one of two that are outside of the United States. You’ll also find the WW II wreckage of a Japanese Zero fighter, and several other military aircraft. This is a must-not-miss experience, if you want to get a feel for the local life at Darwin. You’ll find stalls of exotic foods, home-grown cheeses and produce, and superbly crafted handmade indigenous craft. Watch the awesome sunsets here on the picnic area, and enjoy foods from every part of the world. 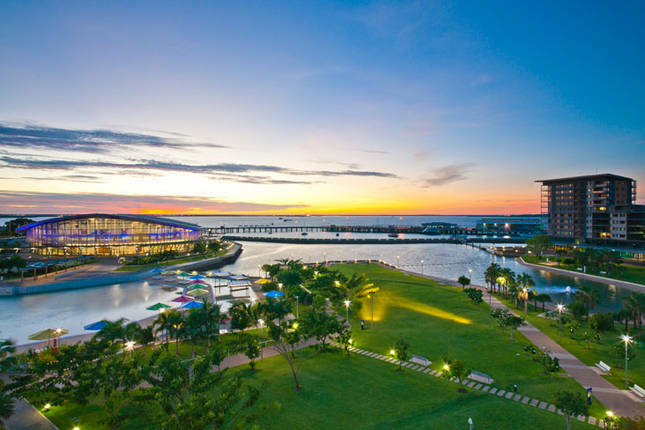 Bicentennial Park is the esplanade that runs the length of Lameroo Beach and Darwin’s waterfront. It’s a lovely park for a stroll. It once used to house saltwater baths, but now this sheltered cove is the perfect meeting place for lovers. Get yourself lowered into a pool or aquarium in a transparent Cage of Death and watch the biggest crocs you’ve ever seen come at you. You can also swim in a pool separated from the croc side by a clear wall. The aquarium also contains several turtles, stingrays and several barramundi sharks as well. There’s also a collection of huge reptiles in the reptile house. This is a rich woodland park containing exotic wildlife and plantlife. Pockets of monsoon rainforest line the escarpment’s bottom. Deep narrow gorges have been carved through the escarpment walls by the force of the waterfalls over thousands of years.